Our Magic Bullet gets used 2-3 times a day. Our household would go into shock if we broke it or something. I never saw the infomercial though -- Boone's parents just bought one for us. You can make chicken salad in it? Maybe I should go read the manual or watch more TV. 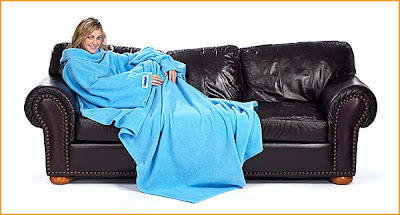 As for the Snuggie -- I cannot believe how many people I know who have ordered one. It baffles me. Seriously, I can't even think of anything else to say about it. 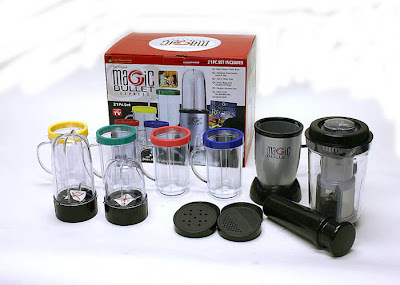 Okay, now I really want a magic bullet. Nicole has made smoothies for me with hers and they are delish! And it is so small! The chicken salad thing just sent me over the edge because I love chicken salad. Go easy on your tummy okay? Hi, Brandi. So I'm outing myself as your blog stalker today. I figure it's OK since I'm sort of related to Chrysta, and Nicole and I already blog stalk each other. They can vouch for me. I just wanted to tell you that I almost bought a Wii Fit, all because of you. (I bought a Bissell Steam Mop because of Nicole, as has just about everyone I know, but that's another story.) I saw five at the store on Friday, went back today to get it and they're gone. Interestingly, we don't even have a Wii, but you made me want it anyway. I guess I'll just have to go to the gym that I pay for and never use. Also thought I'd let you know that you inspired me to join Weight Watchers again this morning, to re-lose the 60 pounds I lost 15 years and 2 children ago. Also went to the gym. (Woot woot!) I'm hoping that by commenting over here, "my" group won't be any wiser, except for the two aforementioned who I trust will keep it on the down low. I'm afraid to fail in front of people I know who know I'm failing. It's true. I'll be rooting loud and crazy for you. I have something similar that I got from Isagenix and I LOVE it! The kids want me to make shakes all the time. You need to put all those recipes on your blog though. They sound gooooood. Did they tell you that you would most likely become lactose intolerant after surgery? It is very common after bypass. The cottage cheese might have been the culprat. I couldn't eat dairy for years after surgery. I still can't drink milk. Melted cheese will make me sick for hours and I can only do ice cream, yogurt and cottage cheese in very small amounts. Do you remember how sick I got from the rich yogurt in Germany? The other thing that most people can't tolerate post bypass is real mayo. It makes my stomach churn to even think about it. Aunt Becky and I have a vivid memory of our first episode of dumping syndrome. We did it together on Chocolate.